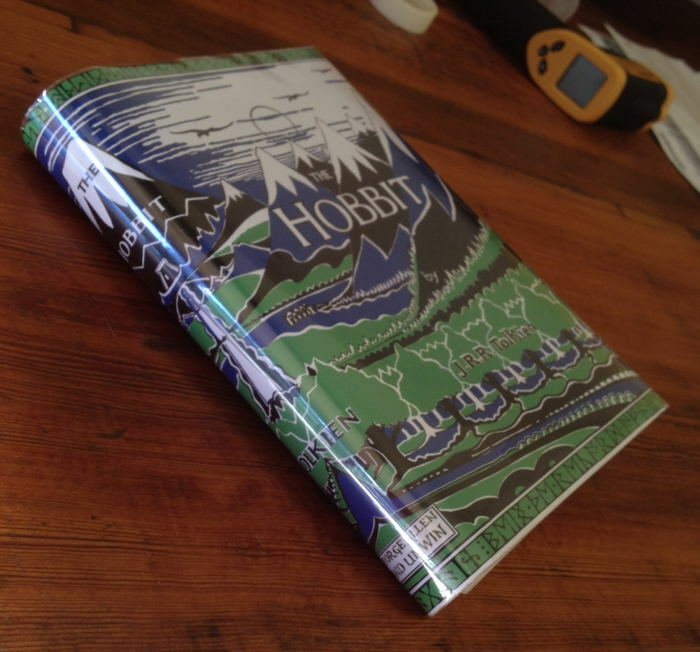 I am looking for companies that can produce exceptional facsimile dust jackets for Tolkien books. Well, 25+ hours of photoshopping and I ended up with something I was happy enough with. Anyone contemplating of converting a 4th Ed Jacket into a 1st, my advice would be -- don't!! Start with a 3rd Edition as there are an order of magnitude less changes required. The local print place ran it off for me on semi-gloss paper on their wide printer for $15 and I'm very pleased with the result. $65 all in for a 1st/4th in a correct impression facsimile Dust jacket feels like decent enough value. If I was going to print it again, I'd probably enlarge it by 1.5mm vertically to lose the white bands top and bottom, which seem to be cut off on the original (as presumably the original jacket printing was a tiny bit too big for the book). I'd also adjust the blue a bit further and change to CYMK to get a bit more colour accuracy from the print place. If anyone wants the 300dpi file for the jacket, it is a about 7Mb, so just drop me a PM with your email address. Thanks to Trotter for his assistance with this little project. Mark Terry from Facsimile Dust Jackets L.L.C. 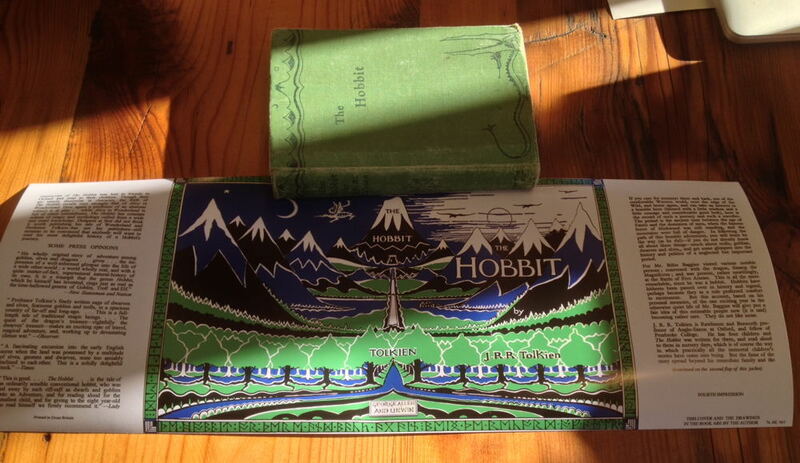 (http://www.facsimiledustjackets.com/cgi-bin/fdj455/index.html) has updated his 1937 UK Hobbit facsimile dust jackets, but not the pictures on the website yet. This is the new version, scanned from an original dust jacket, also shown below, for sale at a ridiculously stupid price from Peter Harrington (£100000). The colour reproduction is not exactly the same, but I actually prefer the darker blue and green, as these are closer to Tolkien's original drawing for the dust jacket. Here are the 4th Impression versions in low res. My final (which has been refined a lot since I printed my copy -- I might reprint on the correct type of paper stock at some point when I am in a decent sized city or I visit a first world country) and Trotter's genuine copy. If you compare the originals between the 1st impression and the 4th, a LOT of differences (and I'm not just talking about the text on the flaps). I think most of the differences come out of the alignment of the plates when printing the three colours (with the white obviously being the paper showing through). The white layer between the feet of the front row of trees shows clearly the kinds of difference between the impressions, in case anyone is interested. I didn't get that layer quite thick enough on my version, but my journey into the heart of darkness is complete, so it will have to do! The changes may be a result of the size of the dust jacket changing between the 1/1st, 1/2nd and later printings, but also the printer changed. A company called FGS printed the first two impressions and then J. Howell for the later printings. In Deagol's article, I cannot see anymore about FGS or what the initials mean? You may notice what looks like a mistake on Stu's facsimile dust jacket. The word 'elves', on the front-flap of the dust wrapper, has two commas after it, instead of one. This does appear on the 1946 dust jacket, it is not present on the 1942 or 1951 dust jackets, and indicates that the text for the 1946 dust jacket was probably reset, and this error occurred as part of the reset. It was spotted and corrected for the second edition in 1951. This is so far the only difference that I am aware of between the 1942 and 1946 Hobbits, the two differences mentioned in the Descriptive Bibliography (page 16), actually occur between the second and third impressions. I used Mark Terry at Facsimile Dust Jackets L.L.C. 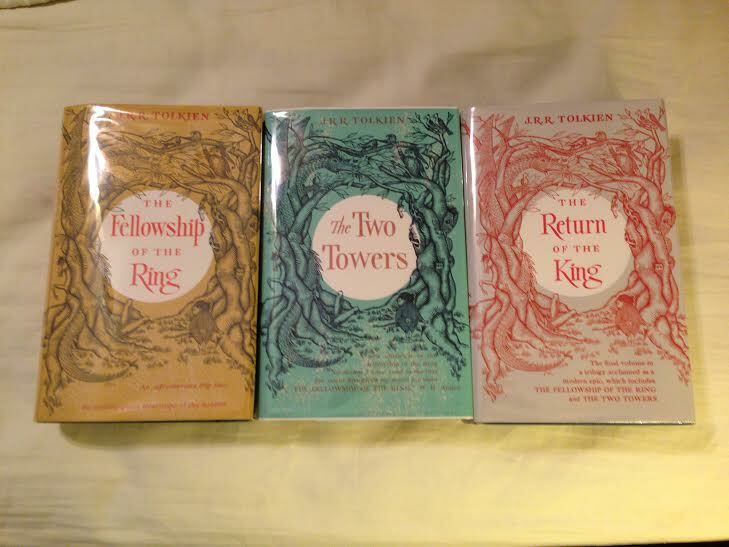 for my US set of LOTR dust jackets and I could not be happier. I would recommend him. Does anyone know where to buy nice cheap slipcases? You might try Tolkien Bookshelf. I have one. Good quality. Just in case anyone is interested in the contents of the 5th impression or 6th impression jackets, I knocked up reproductions (initially to waste time waiting for an MRI scan that I was very early for, followed by an evening wasted to finish 'em up). Low res-versions below (open in another tab to see at more readable size). Note that the jacket text has been typeset in MS-Word from photographs (mostly), rather than being scanned. Useful to see the progressive changes in text from the 4th onward (in the 5th, Tolkien's job changes and mention of Dodgson is dropped), and then on the 6th, the LOTR preview information is added, and all the prior front-flap information is ditched. The main font is Times New Roman, upper case "W" is Bodoni 72 Book, lower case italic "w" is Bell MT, upper Case "M" is Iowan Old Style. The characters '8', '9' and '6' are Athelas. The fifth Impression should have a hand written George Allen & Unwin as on my avatar. Thanks for that - I'll change it back! I didn't have a spine picture of the 5th, and for some reason I thought that was the first impression that switched over to the later version.